About a month ago Ms Jane and I popped by her mother’s house after we both finished work. Joy (her mother’s name) had called and said that her partner, Andrew, had something that he wanted to give me that would need a bit of explaining. Andrew had previously worked for a little company called ‘IBM’. You may have heard of it. He was a call-out serviceman. It was during this period of Andrew’s working life that he and Joy first met and forged a friendship that has lasted several decades. In the most recent couple of years they have grown quite close to each other, and now have a strong relationship. We arrived a Joy’s place at about the time that most civil people would have been doing the dishes after dinner. My work clothes smelled of hospital, and I’m sure my face looked like it had been sprayed with Domestos. I was tired. Joy was just settling in for the evening in her slippers and comfortable clothes, but Andrew had only recently gotten home from work himself and was quite bright and chirpy. Actually, he seemed quite excited. We talked a little about the kind of day we’d all had, and then Andrew disappeard out the back door of the house, and downstairs to a cupboard under the house. He returned with a dusty old box that had originally carried canned fruit sometime in the 80’s, but now hosted a collection of much more interest. When Andrew began working at IBM, their biggest product was the Selectric II/III typewriters. They also were in the process of rolling out their wheelwriters, and variable type wheelwriters. While I sat there, both Andrew and Joy fondly spoke about these variable type machines, and the typewriters of their era. Andrew himself had a few interesting stories to tell of his days of servicing these machines. 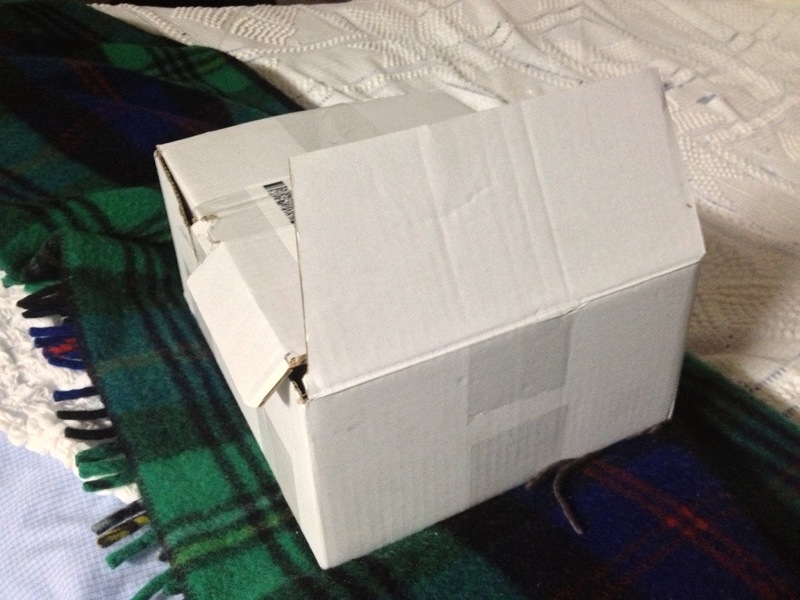 Andrew settled into a glass of red wine, and started to tell me about what all of the parts inside the box where. As we talked, he would often excitedly go off on another tangent with stories of his work life with IBM, and it was a fascinating and interesting conversation. Inside of the box were parts and tools from when IBM’s typewriters were king. There were ribbons (likely dried out now) tools, cleaning swabs, parts and even a parts guide. And to my amazement, these weren’t just parts stripped from a broken down machine. These were new and unused parts. 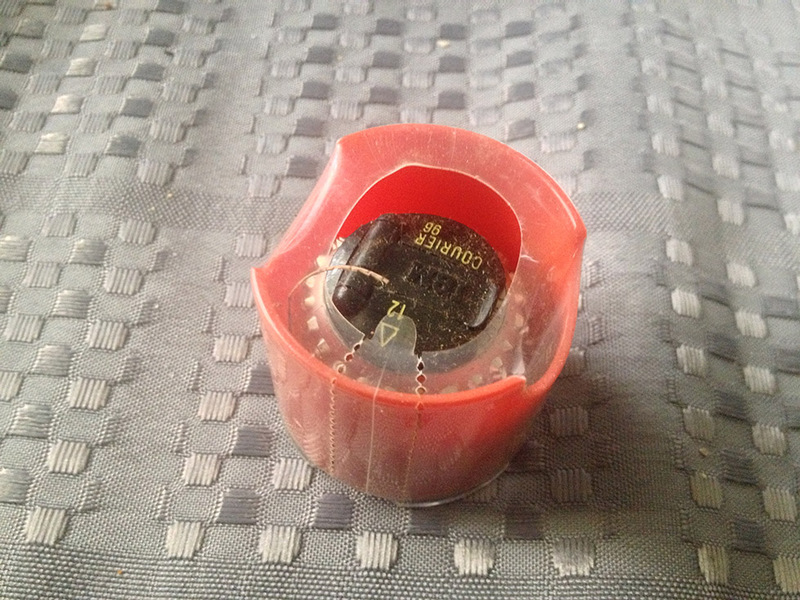 IBM selectric III ‘Golf ball’, still in original retail plastic. Not ‘just’ any parts. But this collection of components covered some quite crucial pieces – including complete shaft assemblies for several different types of machines, and more importantly – a complete IBM ‘Through-kit’; a kit that contained commonly replaced parts, that you would just automatically use to refurbish a machine. 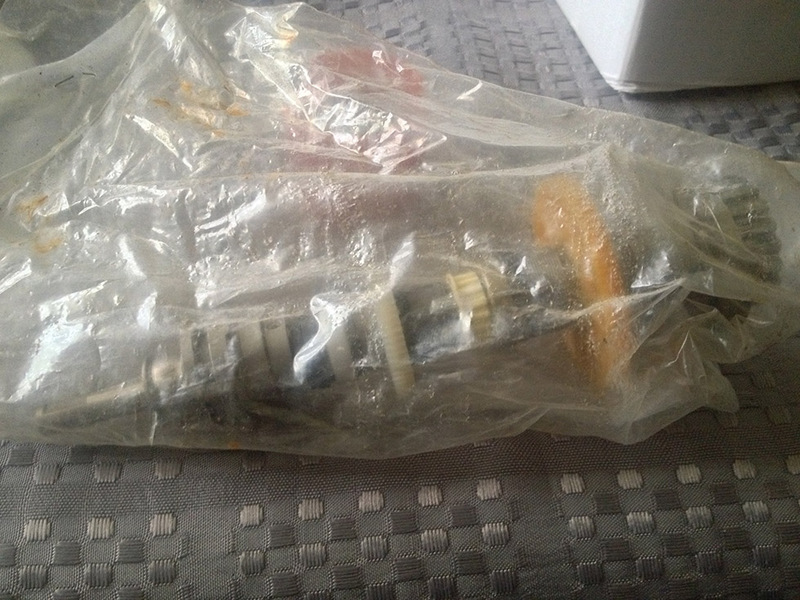 A complete and unused shaft, still in its plastic. Part of the ‘through-kit’, with a few extras thrown in. 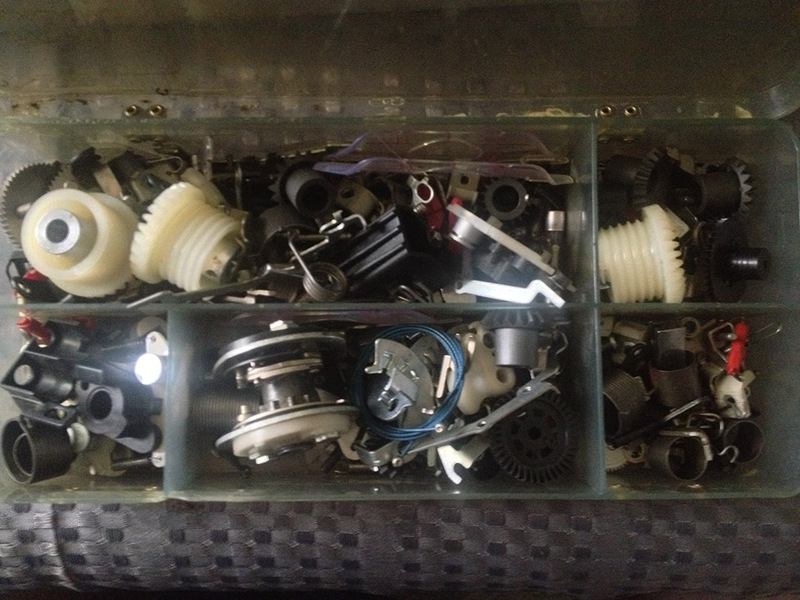 Andrew suggested that I could use these parts to trade and swap for parts with other typewriter enthusiasts. He knew that I had a couple of Selectrics, and knew that the variable type wheelwriters are rather hard to find in Australia. But I had other ideas. The implications of such a collective of parts to me were huge. Sure, I could just swap these and have a couple of machines going. But then again, these were unused and unground parts. In the hands of someone with enough engineering knowledge and CADD skill, along with the right tools, this was a nearly priceless collection of reference parts. Parts that could be reversed engineered, modeled digitally, and potentially used to produce many more parts via the more modern 3D printing and prototyping technology that is available today. Because these parts are unworn, they present the possibility of being able to take far more accurate measurements that could produce better end products. It will take a lot of hard work though. Ms Jane replaced the old box with a new one the moment we got home, as the old box barely survived the trip in the car without spilling its contents everywhere. While we were at Joy’s house, Joy decided to bring out hew own typewriter to show me. 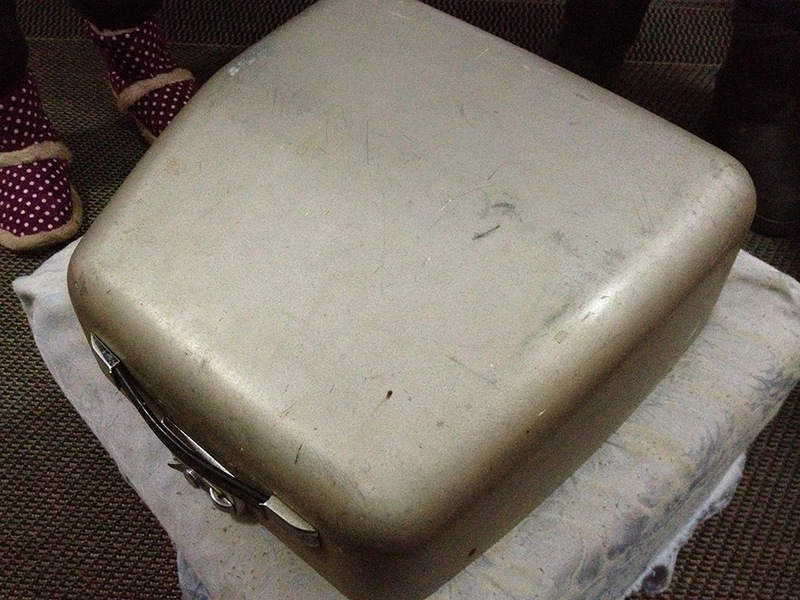 It was a marvelous Imperial Model 6, which has sat in her cupboard for several decades quite neglected. The metallic blue/green of the machine was actually quite eye-catching, and in person quite attractive. The machine has quite a collective of daily use muck in it, and a bit of plasticizer seepage on two keys. With a bit of work, I think this Imperial beauty has real potential to come up looking near new, and I look forward to taking the time to service and clean up a machine that means something to a family member. There is also something of a family story attached to this machine. Joy has owned this typewriter since it was bought new for her by her Aunty, and has probably typed all kinds of wonderful things over the years. I think it is a thing of beauty, and it’s great that she’s kept it. I’m really excited about the box of parts, and it was great to talk to Joy and Andrew about their stories of using and fixing these typewriters. July 24, 2013 in engineering, parts, Selectric, stories, typewriters, variable, wheelwriter. ← A big week for the typosphere, and no one knew anything about it! Very nice slippers Joy. Yes, great find, that box is most certainly worth holding on to! That Imperial Model 6 is fetching indeed. That is great to get all those new IBM parts. The Model 6 is fantastic. I'm sure Joy will treasure her refurbished Imperial Like I do my 1957 Olympia SM3, bought for me by my parents. Of all of the interesting and more valuable machines I have collected, this would be the one I would grab were the house in flames. 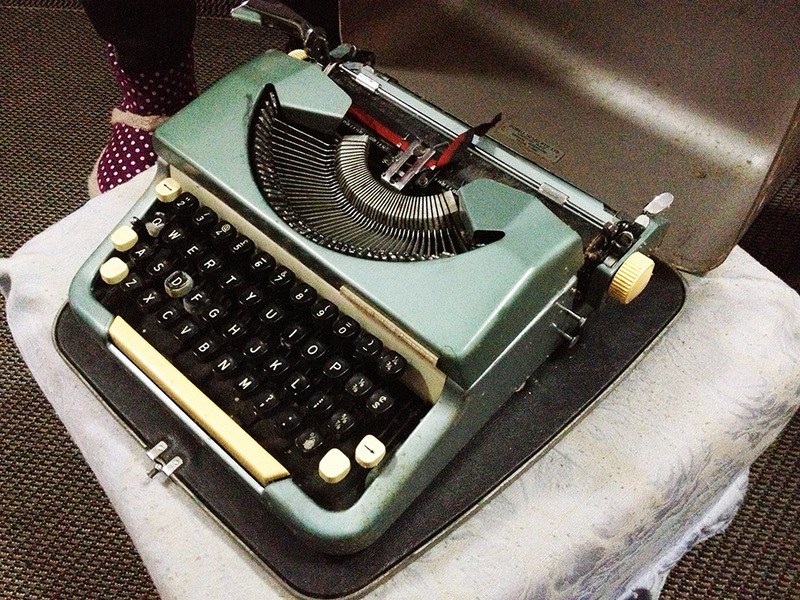 Hopefully Joy will find a renewed pleasure in using her typewriter, like I have using mine. You're right about the reference value of those parts. With ever-improving 3D scanning technology, it may not even be that hard to create CAD specifications. But you'll have to figure out what the parts are FOR. I have several cabinets of typewriter parts coming my way later this summer. Understanding what the heck they are will be the crucial thing. 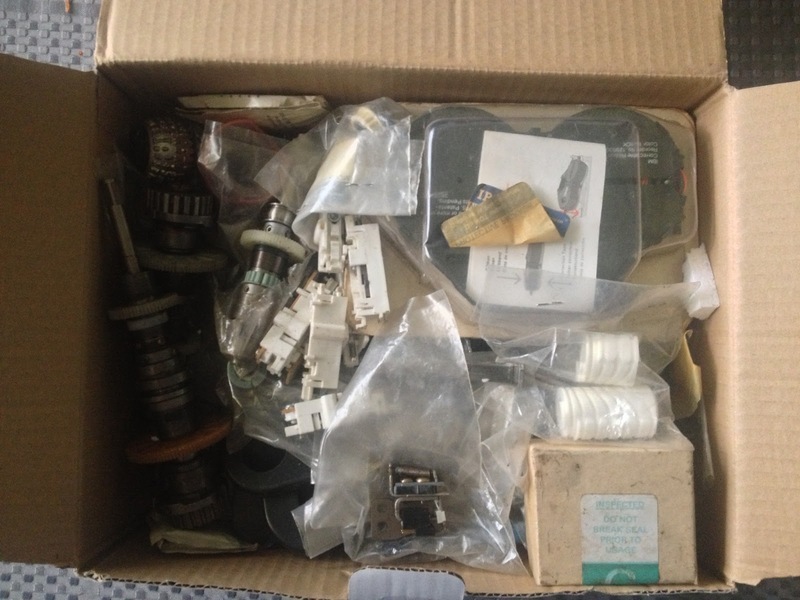 I'm not sure that I could mask my immense excitement over receiving a box of NOS typewriter parts. That's just something you don't see anymore and was fantastic of Andrew to pass them along. They could definitely serve a high purpose, as you've mentioned with the 3D printing, and I look forward on hearing updates about the venture.